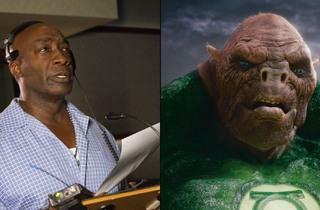 The Green Mile star plays Kilowog in Green Lantern. VOCAL HERO Duncan voices Kilowog. Born and raised on the South Side, supersized Michael Clarke Duncan (6'5", 250 lbs) had his eye on acting, but his stature initially won him bodyguard jobs instead. His breakout role came in 1999, when his portrayal of the gentle giant in The Green Mile earned him an Oscar nod. Since then, his career has tended toward genre pics, including comic-book adaptations (Daredevil, Sin City) as well as voice acting (Cats & Dogs, Kung Fu Panda). His latest gig combines the two: In Green Lantern—which stars Ryan Reynolds as Hal Jordan, a cocky test pilot recruited into an intergalactic peacekeeping force—Duncan gives voice to fan-favorite character Kilowog, the corps drill sergeant who puts his new “poozer” colleagues through the wringer. (He also performs the character in the upcoming animated TV series.) We chatted with Duncan by phone a week before the Friday 17 opening—he was at home in SoCal, though he’d just been back to Chicago to watch his beloved Bulls lose to the Miami Heat in the playoffs. What’s the appeal of the Green Lantern mythos? When I was coming up, I kept a ton of comic books, almost 300 comic books. Back in the day, they didn’t used to cost that much, so I used to keep ’em, collect ’em, trade ’em. There was something about the Green Lantern Corps—especially Kilowog, because he was the biggest one. I always had an interest in the biggest guy. When I saw him fight Superman to a standoff [in a comic], I knew he was cool. You’re 6'5". How tall is Kilowog? Kilowog’s like my brother! He has to be well over eight feet tall, maybe nine. He weighs like 750, 800 pounds. Me and Kilowog got something in common: We both try to stay in phenomenal shape. I wish I had muscles like that! If I had that body and that type of power, you couldn’t tell me nothin’. I don’t imagine people mess with you much. No, they don’t. Plus, two to three times a week, I go to Bikram yoga, so that helps me out. Your honey-drenched bass is one of your greatest assets. Do people constantly remark about your voice? Once it changed at 15, my mother told me, “You’re finally a man now.” At first it freaked me out—I didn’t know what was happening. But women started liking it, so that made me kinda cool. Whatever God gave you, you have to work that to your best ability—especially out here in Hollywood, the land of beautiful people. Recently, actor Idris Elba of Thor talked to the Los Angeles Times, and they discussed the sometimes-hostile reaction from a segment of fanboys who freaked out that a black actor was playing a Norse god. It reminded me of similarly bogus complaints when you starred as the Kingpin in Daredevil. That’s right. Idris is a hell of an actor. I know he pulled that role off with excellence. People always have an opinion. Doesn’t mean it’s right, doesn’t mean it’s wrong, but we have to respect their opinion. I never saw any problem with Idris playing a Norse god—what difference does it make if he’s black, white, Asian or whatever?—just like I didn’t think it was any problem with me playing the Kingpin. I mean, when I grew up, Kingpin was a big white guy [in the comics]. So I went to the director and asked him, “Is this going to be a problem? ’Cause I know how fans are.” But you know, if you really enjoy Thor, Green Lantern, Spider-Man, you don’t nitpick at the little bitty things. I respect people’s opinions, but that’s all they are: opinions. 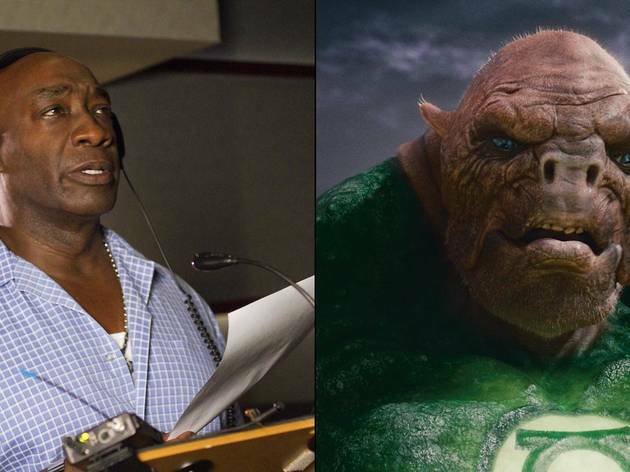 Talking about how race shouldn’t matter—in a way, that’s one of the themes of Green Lantern. It is. All the aliens look different. Really, it’s a universal gathering. Kilowog has never been around a human, but he’s heard about them. He says, “You guys think you’re the center of the universe.” He has his opinion, like any person would have about a particular race that they’ve heard stories about. But Kilowog gets the job done. Green Lantern opens Friday 17.